Addicted To Netflix Streaming? Me Too. : Blog Of The Nation I just found out I have a disease. It's called, "Netflix Streaming Syndrome." Actually, to be fair, it's more like Netflix/Hulu/Xfinity/Amazon/YouTube Streaming Syndrome. While our streaming obsession is easy to laugh off, there's something to be said about our addiction to immediate media content. 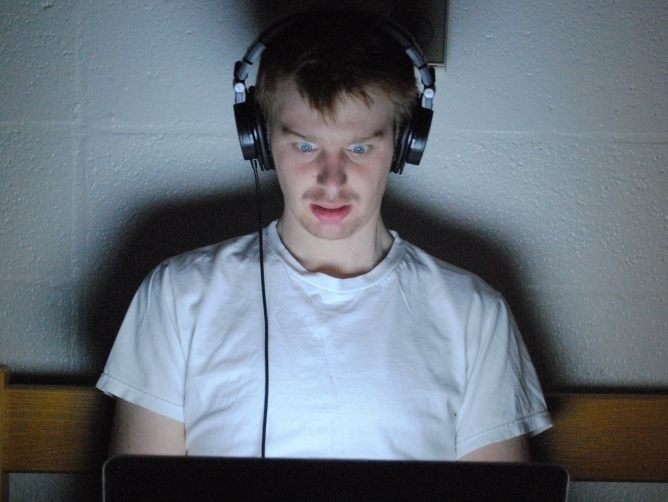 If you ever look like this, it's a definite sign that you have Netflix Streaming Syndrome. I just found out I have a disease. It's called, "Netflix Streaming Syndrome." Actually, to be fair, it's more like "Netflix/Hulu/Xfinity/Amazon/YouTube Streaming Syndrome." While Mr. Moylan's article is clearly meant to be funny, it does point out the discouraging realities of having an abundance of immediate media content only a few mouse clicks away. I've had my fair share of weekends in which I've opted for a "Netflix night" rather than go out with my friends, and I'd be lying if I didn't admit to attending class exhausted after long nights of "Lost" marathon sessions. And the thing is, after I hear how much fun my friends had and when my test gets handed back, I usually end up regretting my streaming decisions. So what's the solution? Well, it's not as simple as popping a pill or getting shot; Mr. Moylan suggests the old idea of self-control. For example, limiting myself to only one episode of "River Monsters" a night instead of the entire season. It'll take some real effort, but who knows, I might just find that I actually enjoy hanging out with real human beings.